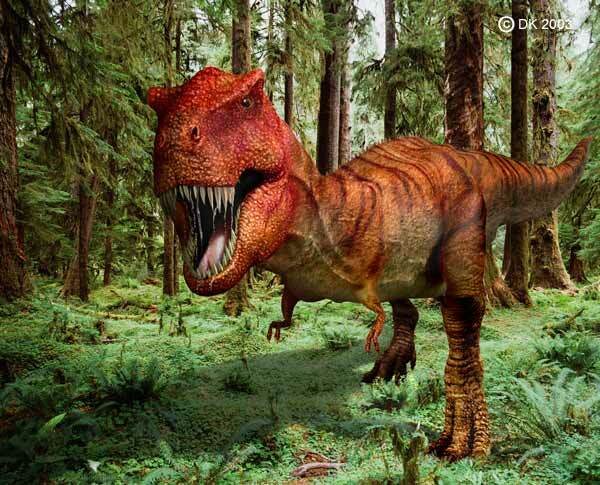 No dinosaur in history has engendered such fascination and interest as the remarkable theropod dinosaur by the name of Tyrannosaurus rex, the “Tyrant Lizard King.” In height and weight the animal certainly is among the contenders for “Mr. Big,” if not the clear winner in the dinosaur world. Nothing alive today approaches this creature in terms of sheer size and potential danger. The teeth from Tyrannosaurus rex are the largest and most massive of any dinosaur. They nonetheless are frequently snapped off as the carnivorous dinosaur bites into bones of it prey. Estimates of the amount of force in this bite vary from as low as 13,000 to as much as 235,000 Newtons. In any case this force can only be imagined by comparison with an alligator bite at a measly 9000 Newtons. This figure illustrates the shape and size of a T. rex tooth. In spite of their massive crossection, the teeth break off and are occasionally found with Edmontosaurus bones in our quarry. Use your mouse to turn this tooth. The skull that frames the teeth grew to five feet (1.5 m) in length, and according to recent estimates, it probably weighed in excess of half a ton, as much as a full-grown horse! It was balanced atop a 45 foot long (13 m) body that may have weighed 6 or 7 tons. That is a lot of dinosaur! There are some other unique features accompanying this huge mass. Among the most interesting are the very tiny arms that are so short (less than 3 ft long, about 1 meter) that they seem not to have had a function. 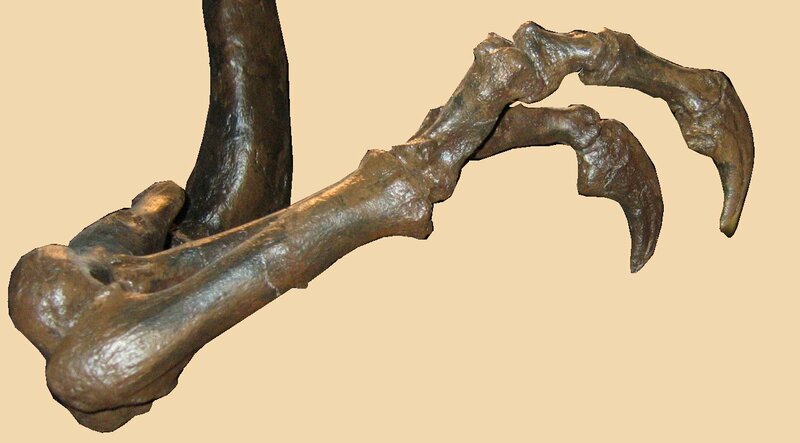 But muscle attachment scars indicate that they were very strong, and they were equipped with significant claws. The arms thus must have had a function. The arms could not reach up to the huge mouth, nor could they be used to help a fallen Tyrannosaurus rex to get up. We can only imagine what that function could have been. What do you think?